If new to the page- start from the top. If not, scroll down for updates. I'm cheap. And I like home theater and audio. In my theater room, I am using a Behringer EP2500 amplifier to drive my subwoofer. I need a subsonic filter to protect my subs from over-excursion at extremely low frequencies. Behringer includes two switchable 12db/octave (2nd order) high-pass crossovers with the units, but the frequencies (30hz and 50hz) are too high for what I am needing. I was able to find a schemtic and have identified the opamps and components that set these frequencies. 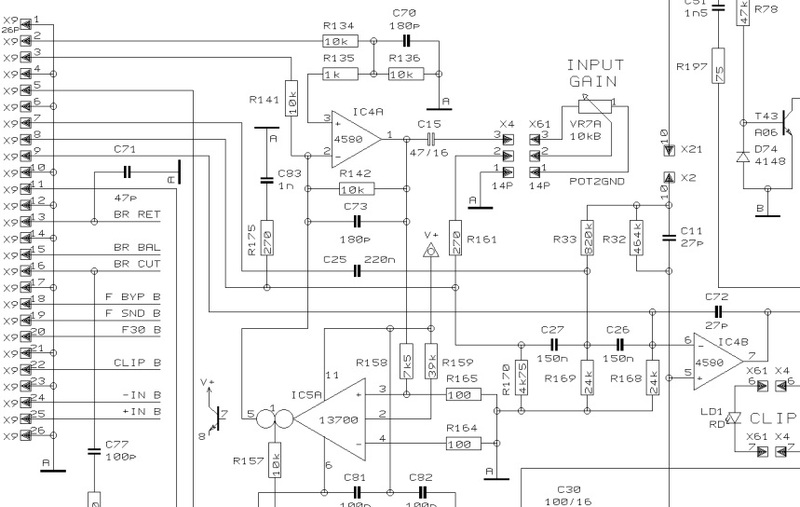 The opamp is a TI 4580 opamp. It's IC4 (ch1) and IC6(ch2) on the amp. This is a dual-channel opamp. One half is used as the input buffer, the second half is used for the LP filter (or inverting amp for bridging/parallel mode on ch2). DISCLAIMER: I am not an electrical engineer. I do this as a hobby. At this time this is simply a mental exercise- I have not made these mods and I have only been examining the schematic for about an hour. These are notes more for me so that when I wake up in the morning, I will be able to remember what I did today. When I do these mods, I will post back my results. Please take my info with a grain of salt. The signal enters the amp board at pins 2&3. It is buffered at IC4A, DC protected at C15 (HP filtered around 3hz), then sent to the gain pot (VR7A). From there, the default (50hz HP) signal path is thru R161 and then enters the 50hz HP filter consisting of C27, R169, C26, and R168. Bypass mode (pins 8&9) bypasses these components and drops the signal directly into the input of IC4B. 30hz mode (pins 8&7) sends the signal thru C25 (bypassing C27) and into R169, C26 and R168). The components for ch2 are C32 (30hz), C29 (50hz), R179, C34, and R174 and IC6. I have come back and studied some more. I modeled the above HP filter in CircuitMaker and it appears that it would be pretty straightforward to change the 50 Hz filter to something more appropriate for vented, IB, or LLT sub use. Changing R168 and R169 to 70k changed the modeled response to somewhere closer to 11-12 Hz. This is a start. Time to find time to hit the bench for some soldering time! If someone out there has already done this, please leave me a note below!